Andhra Pradesh is fast becoming a hot zone for development and progress. Major economic and infrastructure projects are coming up in the state after the bifurcation. Andhra Pradesh has been making major progress and there have been major developments across the board particularly in the Governance, Justice, Finance, Education and Knowledge, Health, Sports, Media, Electronics, and, Tourism sectors. This presents unique and incredible opportunities that are unprecedented in recent times. 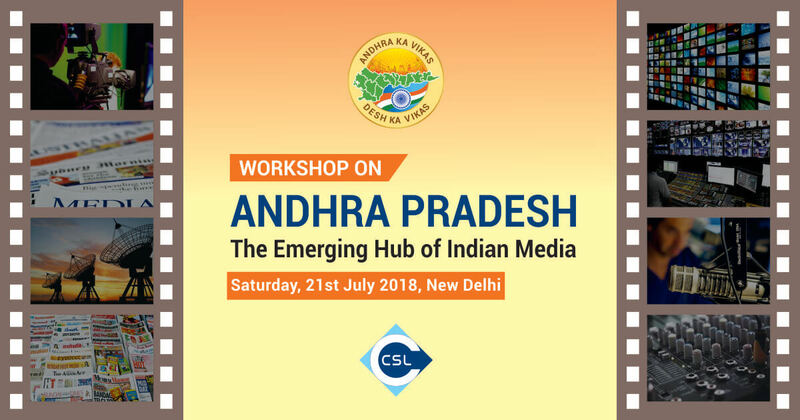 In this backdrop and with regards to the potential and the opportunity in the state for the Media industry, Centre for Strategy and Leadership is organising a workshop titled "Andhra Pradesh: The Emerging Hub of Indian Media". The workshop will focus on Andhra Pradesh’s emerging media sector and the session is from 10.30 am - 1.30 pm followed by lunch on Saturday, July 21, 2018, at Vice Regal Hall, The Claridges, New Delhi. This workshop is an excellent opportunity for representatives of the media industry to learn more about the major economic and infrastructure projects planned and underway in Andhra Pradesh. The workshop will be attended by approximately 100+ journalists and representatives from the print and electronic media as well as allied associations and organisations. Senior Government Officials from Andhra Pradesh State Government will interact with the participants and take up questions on the theme. Those wishing to participate in this workshop and gain invaluable knowledge and perspective on the topic may submit their request for partipation by filling up this form. Any queries, clarifications and information can be addressed to Ms Raksha Sharma, Manager (email: raksha@cslonline.org , mobile: 9212129276). Kindly note that this is an exclusive closed-door workshop and discussion for a select audience and entry is by confirmed reservation only. Confirmation of participation depends on availability of seats, therefore kindly submit your request for participation in advance. The workshop was completed successfully. Please click the button below to view the workshop report.